Despite the similarities between Mac and PC, using Windows 8.1 can be very annoying for Mac users. Here’s why the two camps are so far apart. Now that Carmageddon: Reincarnation is released to the public in a Steam pre alpha version for Windows, I had no choice 😉 but to install Windows on my MacBook Pro in order to test it. Since I now had a Windows machine as well, I thought I might as well try it out. Before we even begin, I should mention that when you’re trying to familiarise yourself with an Operating System, any experience on a different OS can be a handicap, as much as it can be an advantage. For example: The Mac OS X Command key is the same key that Windows uses for the Windows key. It has a different function or you could say that the key is on a different place. Selecting, cutting, copying, pasting and most other keyboard shortcuts that have become a second nature on a Mac, lead to unexpected results on a Windows PC. No matter how annoying, this is of course just a matter of getting used to and doesn’t make one a better OS than the other. Although I must admit that it’s easier on the hands to use combinations with the OS X CMD key, since it’s placed closer to the natural position of the thumbs. Installing Windows on the MacBook itself is left out of the equation, because usually hardware comes with the OS installed on a Windows PC. One of the first things I ran into, is that my Wacom Intuos Pro Medium tablet doesn’t work. On OS X, it works right out of the box, but in order to use it in pen modus and control other settings, you’ll need to install the appropriate driver on both OS-es. On Windows 8.1 however, the Tablet Properties panel looks very bad. It’s as if it’s build from smaller blocks that are cut off because the text didn’t fit. Is this because of a setting that I need to adjust first? Then why are other preference panels looking just dandy? I found the responsible setting: rightclick on a free place on the desktop, select ‘screen resolution’, then ‘make text and other items larger or smaller’, enabble the option ‘let me choose one scaling level for all my display’. Then select ‘medium with 125% instead of 150%. The current driver does not adjust the scaling well for the 150% setting. This sounded almost too easy — and it was. 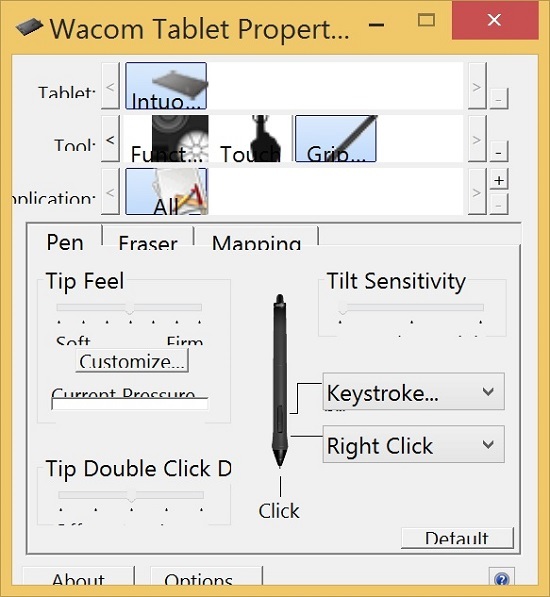 On the bright side: The Wacom control panel text becomes so small that it fits the panel. On the not-so-bright side: This is ridiculously small text and the whole Windows OS now is displayed in it. 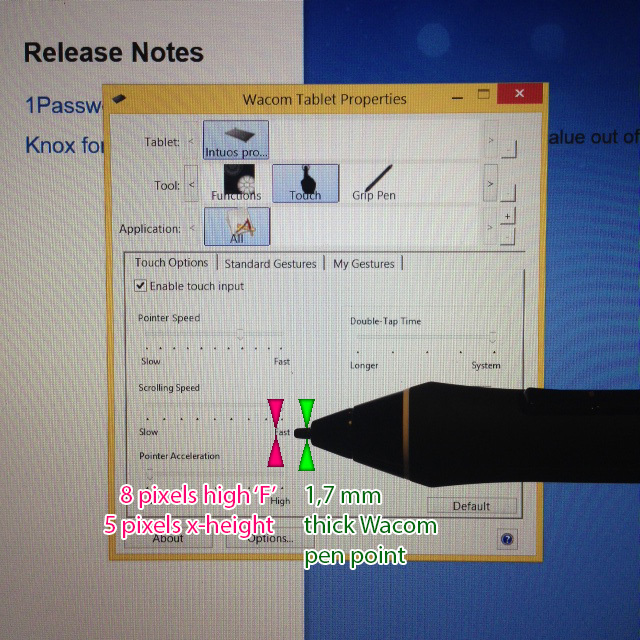 Obviously, Wacom is not up to speed yet with the possibilities of high resolution screens. 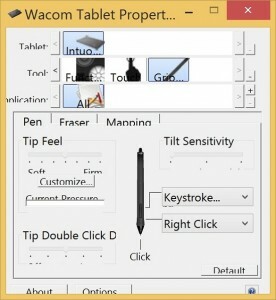 Wacom driver texts are smaller than a Wacom pen point is thick. For reference I made a photo. The Wacom pen is right in front of the MacBook Pro’s retina screen. As you can see, the capital X (or F) – let alone the x-height – is smaller than the pen tip – which is only 1,7 mm thick at its thickest point.